Live Healthy, Live Happy, Live Long! 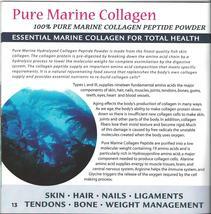 Pure Marine Collagen 500 mg. Capsule – 120 capsules With Natural Hyaluronic Acid Essential Minerals from deep ocean waters not fish farm, not bovine or porcine, no crushed bones. The Health Benefits: Helps skin, hair, nails, ligaments, bones, tissues, tendons, weight management Helps to keep joints healthy and flexible Builds bone matrix. Improves skin texture, elasticity, radiance, and a clearer complexion. Corrects weak, broken, split, ridged, and damaged nail beds. Thickens fine hair, adds body, and slows down hair loss. Repairs connective tissues for improved elasticity, blood vessels to help improve circulation, and promotes wound healing. Builds lean muscle to help burn fat while you sleep. 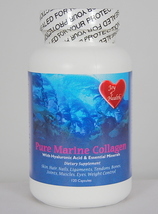 Dietary Supplement The word collagen is derived from kolla, the Greek word for glue. Collagen is the primary protein in the body more than 90% of the total collagen found in the body is Type I III. It is an essential and major component of muscles, tendons, cartilage, ligaments, bones, gums, teeth, eyes and blood vessels. As we age levels of amino acids (protein building blocks) our body needs to make collagen protein are reduced so there is insufficient new collagen to keep skin, joints, and other parts of the body healthy. 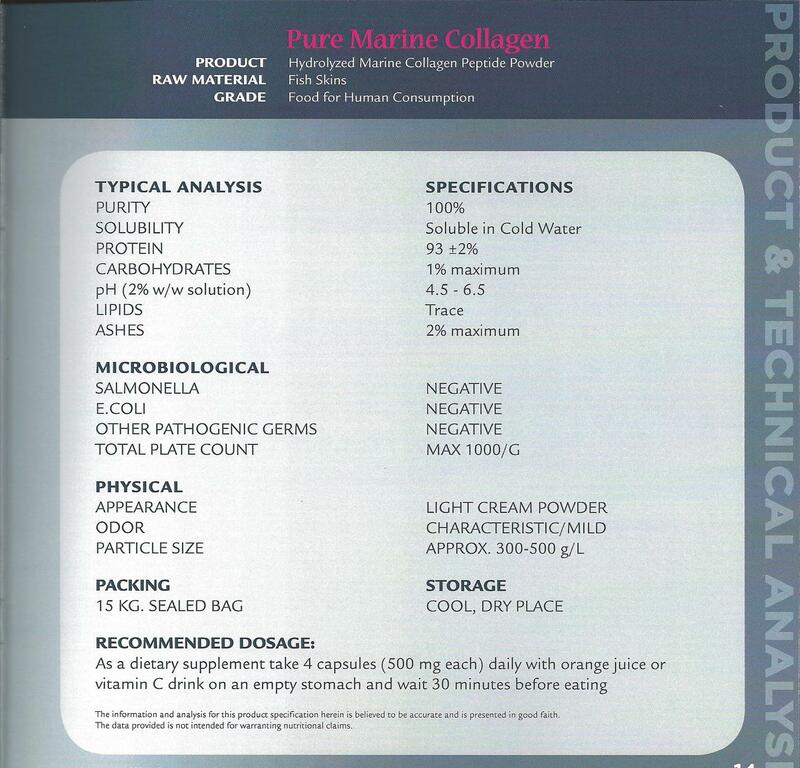 Pure Marine Collagen provides an important amino acid composition, hyaluronic acid, and essential minerals. It is a natural rejuvenating source that replenishes the body’s own collagen supply and provides nutrients to re-build collagen Type I III cells. 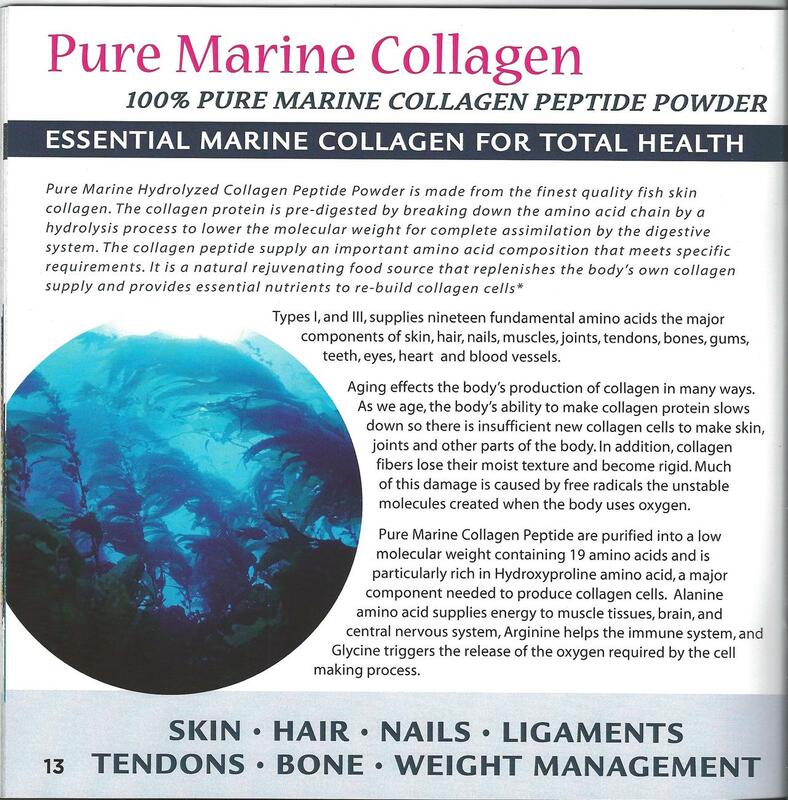 Pure Marine Collagen is a highly purified into amino acids to insure assimilation and is particularly rich in: Hydroxyproline: A major component needed to produce collagen cells. Alanine: Supplies energy to muscle tissues, brain and the central nervous system, and strengthens the immune system. Glycine: Triggers the release of the oxygen required by the cell making process. 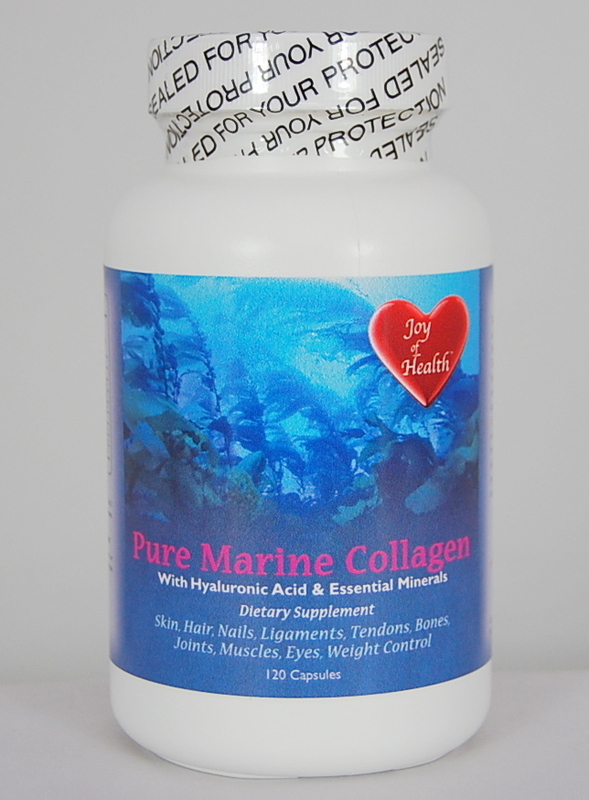 Fish Collagen is a complex, structural protein that helps to maintain the strength and flexibility of skin, ligaments, bones, joints, muscles, tendons, gums, teeth, eyes, blood vessels, nails and hair. 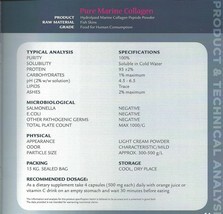 Hydrolyzed Fish Collagen provides an important amino acid composition that meets specific requirements. It is a natural rejuvenating source that replenishes the body’s own collagen supply and provides essential nutrients to rebuild collagen cells. Fish Collagen is particularly rich in: • Hydroxyproline - a major component needed to produce collagen cells for a healthy body • Alanine - supplies energy to muscle tissues, brain and central nervous system and strengthens immune system through its effect on antibody production • Arginine - helps immune system stimulation and healing process • Glycine - triggers the release of the oxygen required by the cell-making process Fish Hydrolyzed Collagen Amino-acid (g/100g protein) 8.2 8.7 5.0 0 11.3 20.4 1.3 1.5 10.3 1.5 2.6 3.4 0.8 2.3 12.4 3.4 2.7 0 0.4 2.0 Alanine Arginine Aspartic acid Cystin Glutamic acid Glycine Histidine Hydroxylysine Hydroxyproline Isoleucine Leuicine Lysine Methionine Phenylalanine Proline Serine Threonine Tryptophan Tyrosine Valine THE IMPORTANCE OF COLLAGEN COLLAGEN – is the major structural protein of all mammalian body. The word collagen is derived from kolla, the Greek word for glue. It is a strong fiber that weaves throughout the body for strength and support to factually hold the body together. Collagen is the most abundant protein in the body and is found in many types throughout the body. Twenty eight types have been identified to date and the most researched are types I, II, III, IV, V, VI, and X. Aging effects the production of collagen and the body’s ability to produce collagen slows down as we age. The levels of amino acids (the building blocks of protein) our body needs to make collagen are reduced. Collagen protein is composed of amino acids responsible for growth, maintenance, and repair of our bodies. Collagen has an unusually high proportion of the amino acid glycine and proline, as well as hydroxyproline and hydroxylysine. These amino acids are essential elements for the production of lean muscles, healthy bones, and firm youthful skin. Scientific research and studies indicates that more than 90% of the collagen found in our body is Collagen Type I Type III. These two types are found in all connective tissue, eyes, skin, nails, hair and bone. Type II collagen is the major component of hyaline cartilage. Collagen Type II is rich in hyaluronic acid and mucopolysaccarides. Type V collagen is non-cartilaginous tissue. Type I collagen accounts for the majority of the collagen mass and collagen Type V is a minor component. Type V collagen has been implicated in the regulation of fibril diameter, and recently reported preliminary evidence shows that type V collagen is required for collagen fibril nucleation. Type X collagen may have a role in providing mineralization and structural support for articular cartilage. Collagen supplements work naturally within the body as a bioavailable food source. Collagen is a protein processed with optimum molecular weight for easy assimilation. It activates the body’s own fat burning mechanism while increasing metabolism. Thus, the body has more energy, strength and stamina. “Collagen increases blood circulation because it exhibits one of the highest dynamic effects (increase in metabolic rate and rise in body temperature) of any food” - Nutrition Report International “Proline and hydroxyproline are essential for collagen formation and maintenance, useful in all conditions effecting status of supporting structure, and in reducing collagen degeneration during the aging process” - Amino Acids in Therapy Why are supplements so important to our health? In an ideal world, we would all eat well all the time. Even if the food we ate were as pure as the water, it still couldn't provide the optimal amount of specific nutrients, so to protect our telomeres (the protective ends of our Chromosomes that support healthy cell replication) we must push our first defense to high alert. The bottom line is that no matter what some nutritionists may say, depending solely on food for your nutritional needs is not enough. If you want to keep your telomeres healthy, you need the right foods and supplements to put up the strongest possible defense against the disease of aging, to which you would otherwise fall victim. Our cutting-edge nutritional supplements will promote cell rejuvenation and enhance health and longevity! *These statements have not been evaluated by the food drug administration. This product is not intended to diagnose, treat, cure or prevent any disease.